It's a beautiful day for a game. Looks like the fans are taking advantage, too. Under an hour to kickoff, and there are roughly 35 people in the stands. Guess this is a good one to tailgate for. Not much pregame news to report. Oh, there's the new heightened security precautions. Pretty stringent. 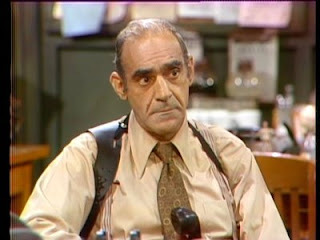 I just got frisked by Fish from Barney Miller. Geez. I figured he'd be enjoying his retirement. And is there a more awkward moment than preparing to be patted down? I thought I'd gotten over all that in juvie. The URI players are doing their stretching, and Michael Jackson's "Thriller" is playing over the P.A. I'd pay anything to see them break into the choreographed dance routine from the music video. How many hits would seeing 70 football players in full pads reenacting the dance routine from Thriller? A hundred million? A billion? I'm heading down to do the "Reporter's Roundtable" with Neill from the Connecticut Post and Bob Joyce from WTIC-1080. I enjoy the segment. But I just realized it means having to go back out to the parking lot to the WTIC gazebo. I don't mind the long walk. It's a second meeting with Abe Vigoda at the press gate that's gnawing away at me. Ugh. See you post game with some notes. Abe wouldn't let you off the hook for old times sake? Abe took his job a little too seriously. Feeling queasy? Have a slice of Tuesday notes.